Today's Draw: Ace of Pentacles from the Victorian Romantic. Are you tired of waiting for things to get better? Could you use a new start? A boost of confidence? Earthquakes. Hurricanes. Tumbling world markets. Oh my! If you're like me, you're waiting for all the bad stuff to be over to breathe easy and feel confident again. 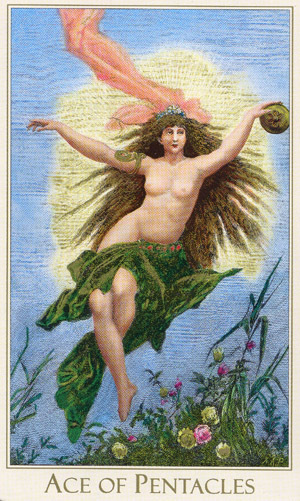 The Ace of Pentacles brings the fresh beginning and feeling of prosperity you need to do just that. But there's a catch. You have to feel it first. It's never real until you feel it anyway. And feeling it can make it real. Which means you can start right now. As long as we continue to feel weary and put upon by world circumstances, the more weary and put upon we'll feel. Really. Try it. Negative emotions are like a snowball...they just get bigger and bigger the more you keep them rolling. And positive emotions are the same. The Ace of Pentacles came today to remind me (and you) that we can feel prosperous anytime we want. Without spending a penny. For example, you probably have some sort of something—a wine, treat, bath bubbles, special candle—that you're saving for a special occasion. Make today that special occasion. Savor it as if it were in unlimited supply. Better yet, make like you're Oprah and this is an everyday thing. Nothing special on hand? Do something special. Drive out into the country and look at vacation spots for sale as if you can afford two of them. Imagine all the renovations you'd do...granite counter tops, Viking appliances, jetted tubs. We can feel stable and secure, whether the world reinforces that feeling or not. Because the confidence isn't in the outside world, it's within us. It's knowing you're going to be OK no matter what. If you can find joy in simple pleasures—petting your dog, watching a sunset, reading a book—you'll never be without a source of joy. You'll be infinitely abundant. Economies will go up and down. Weather will go up and down. And you can ride the rollercoaster with it or get off the rollercoaster altogether and celebrate a new beginning and new prosperity today, tomorrow and every day of your life. One of the best ways to do that is to find five things you're grateful for every day. That will show you what matters. For me, one or two those things usually have to do with my dogs. The more you practice this, the more you'll realize all you have to be grateful for. And you know what will happen then? That will snowball and you'll find you have even more things to be grateful for. Abundance and security is always ours. Believe it and make it so.